National SCORE association website. 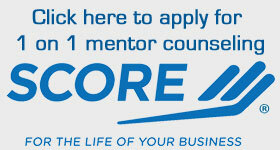 Resource for one on one mentoring, on line mentoring, business start up templates and forms, programs and seminars, webinars and how to subscribe to SCORE’s online newsletter. Learn about financing, training and advocacy for small businesses. Is responsible for the delivery of SBA’s many programs and services to the 72 counties of Wisconsin. The Wisconsin office assists businesses by providing financial assistance through a variety of loan programs. Download shareware, freeware, and public domain programs that help you start, finance, or expand your business. Learn about area businesses, business seminars and networking opportunities. Read about the Fox Cities including a Regional Profile, Economics and Demographics, Relocation Issues, and more. provides hands-on assistance to business owners through classes, one-on-one assistance, and access to capital through direct lending programs. provides women business owners and women in business an arena to build rewarding relationships both personally and professionally, along with offering programs geared towards the problems faced by women owned businesses. Experts, networks and resources to help you with your small business ? whether you’re just starting up or whether you’ve been in business for years. SCORE Oshkosh Branch Over 20 volunteers serving the Winnebago County area for 17 years. SCORE Fond du Lac Branch Serving the entrepreneurial needs of the southern Lake Winnebago area. ORIGIN Oshkosh Regional Innovation and Growth Incubator Network – an entrepreneurial network of experts and services in Oshkosh, NEW North, and Northeast Wisconsin. Fond du Lac Association of Commerce Developing Partnerships. Creating Opportunities. Building Community. The Fond du Lac Area Association of Commerce has been fighting for the economic viability of our business community since 1912.